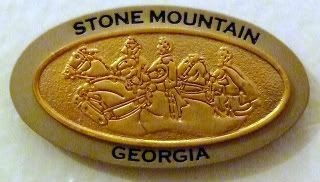 So, nestled off to the east of Atlanta, is Stone Mountain Park, where nestled in the heart of its 3,200 acres, is Stone Mountain, where nestled in the center of its 825 feet tall x 1,683 feet high x 583 acres, is this giant stone relief of about 90 feet by 190 feet - three acres big. It's a Civil War monument with Confederate President Jefferson Davis, General Robert E. Lee, and Lt. General Thomas "Stonewall" Jackson. Very cool park - you can stand at the base of the mountain, with a terrific look up at the carving, situated about 400 feet up and then you can take a tram up to the top - or you can climb the 1.3 miles to get up there. Uh, yeah, just guess which one we did. Heh.